October 12, 2018 -- An injectable anesthetic may be able to dull pain after major implant surgery. A recent study found that the bupivacaine liposome injectable suspension Exparel significantly reduced pain for patients who underwent full-arch implant placement. Pain after complex dental procedures can be severe, and the dental community is eager to find nonopioid or limited opioid options to treat this acute pain. That's why researchers were interested in investigating Exparel (Pacira Pharmaceuticals), an injectable analgesic first approved by the U.S. Food and Drug Administration in 2011. Their study findings were published in the International Journal of Oral & Maxillofacial Implants (September/October 2018, Vol. 33:5, pp. 1155-1164). "Addition of liposomal bupivacaine 266 mg to an opioid-sparing postsurgical pain management protocol for full-arch implant surgery significantly reduced pain scores compared with the same opioid-sparing postsurgical pain management protocol without liposomal bupivacaine," wrote the authors, led by Philip Iero, MD, DDS, the medical director at ClearChoice Dental Implant Center's Bellaire Facial, Oral & Dental Implant Surgery practice in Houston. Previous scientific research has established that Exparel can effectively reduce postsurgical pain for some procedures, such as the removal of hemorrhoids and bunions. However, the use of a liposomal bupivacaine injection has not been readily studied in dentistry. The researchers of the current study were curious whether an injection of Exparel at the end of major implant surgery could reduce postsurgical pain. To find out, they conducted a randomized, prospective study with 69 adult patients undergoing full-arch implant surgery. All patients received local infiltration using 2% lidocaine with epinephrine and also a local infiltration using 0.5% bupivacaine with epinephrine. In addition, 34 of the patients received a 20-mL injection of Exparel (total dose of 266 mg) at the end of the implant surgery. For postsurgical pain, the researchers prescribed all patients 600 mg of over-the-counter ibuprofen every six hours and one to two tablets of oxycodone every six hours as needed. They then asked patients about their pain intensity at 10 time intervals in the week following surgery. At each occasion, patients categorized their pain on a scale of 0 to 10, with 0 meaning no pain at all and 10 meaning the worst pain they have ever experienced. Patients who received the Exparel injection at the end of surgery reported significantly lower total pain scores than those who did not receive the injection. They also reported higher satisfaction with their pain management experience in the first two days after surgery. "These findings suggest that liposomal bupivacaine in combination with ibuprofen may provide sufficient pain relief in some patients," the authors wrote. While those who received the injection reported significantly lower pain, there was no significant difference in their oxycodone or ibuprofen use. The authors attributed this to the study's small sample size. "Numerically, there were more patients who were oxycodone-free, and there was a numerically lower overall usage of oxycodone in the liposomal bupivacaine group compared with the control group," they wrote. "However, none of these differences in opioid consumption reached statistical significance, which may reflect the study's relatively small sample size and insufficient power." The authors noted that their study had a number of shortcomings, including that it was not a blinded study, so both the patients and researchers knew who was in the experimental and control groups. In addition, the researchers did not adjust for potential confounding variables, such as anxiety. 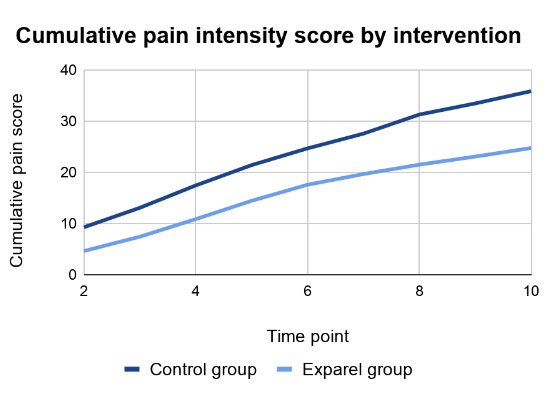 Nevertheless, it is a promising preliminary study on the pain management effects of Exparel for major implant surgery. The researchers hope larger, blinded studies will follow their initial work. "Although there is a need for larger, blinded studies to confirm these findings, the current results suggest that the addition of liposomal bupivacaine to an opioid-sparing postsurgical pain management protocol is safe and efficacious for full-arch implant surgery and may result in a better experience for patients," the authors concluded.